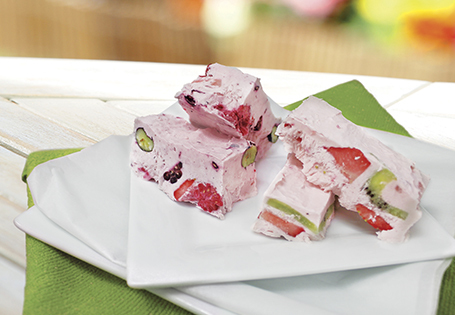 Mix and match your favorite cream cheese, yogurt and fruit to create a delicious one-of-a-kind dessert. In a medium mixing bowl, cream together cream cheese and yogurt until smooth. Fold in whipped topping, then stir in your favorite fruits. Line an 8x8-inch pan with plastic wrap; pour mixture into pan. Freeze for 8 hours. Let rest at room temperature for 5 minutes before cutting into squares and serving. TIP: Use an egg slicer to slice the kiwi and strawberries. It will save you time and give you consistent slices.